Any kind of individual geotracking may sound unnerving at first, but if you can control who is able to see your location and when, it can be a convenient way of keeping an eye on the kids, making sure everyone meets at the same bar, or working out how long it’ll be before your better half gets home from work. Here are six apps specifically for the job. Now a default native app inside iOS (one you can’t get rid of), Find My Friends links with your Apple ID and enables you to share your location with the people of your choice. It’s possible to temporarily disable location sharing at any time, and on a device-by-device basis if you have multiple iOS gadgets. Linked friends and family show up on a map and this being Apple it works seamlessly across various apps on iOS and OS X—the most recent addition was an iCloud component that lets you track your contacts on the web. If all of your friends are on Android or Windows however, then you’re out of luck. Once upon a time there was a half-decent service called Google Latitude—after it was shut down, some of its features eventually got folded into Google+, including location tracking. Open the Locations entry on the menu inside the Google+ app for Android to see your contacts on a map. Unfortunately for location-tracking enthusiasts, this feature doesn’t seem to be a high priority for Google. You need to head to the main Google app to configure your location settings and define who can see where you are, and at the moment there’s no map available on the web or inside the iOS app. If you want an independent, cross-platform, third-party location sharing service that isn’t tied to iOS or Android then Glympse is just about your best option right now. It’s primary reason for being is location sharing, so there are a ton of features included to make the service as useful as possible. You control not just the people can see your location but how long they’re able to view it for, and there’s a web interface if you’re sat at a computer. The app’s versatile enough to do everything from organizing a group night out to telling your boss you’re running late, and messaging tools are included too. Swarm’s main focus is checking into places and competing against your friends to earn more points along the way, but being able to see whereabouts your friends are is another component of the app. In the meantime, Foursquare has retreated to focusing on being more like Yelp. 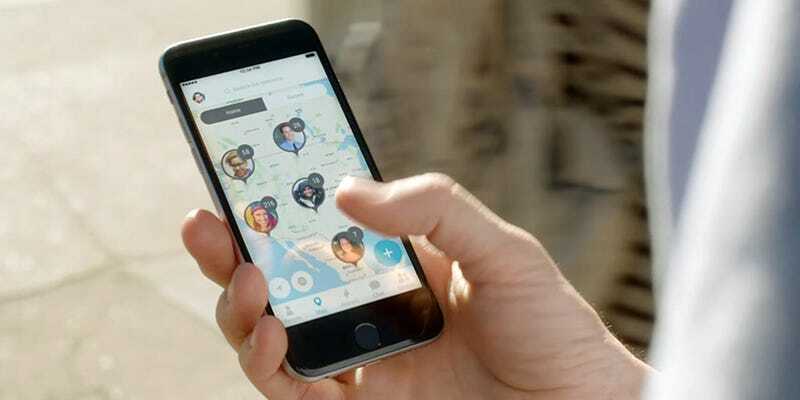 The app includes features for finding out which of your friends are hanging out nearby, and you can use the integrated messaging component to arrange a meet-up. You don’t get the same real-time tracking you do with other apps, but it’s a bit more user-friendly and more helpful for casual get-togethers. Like Google+, you can sort your contacts into ‘circles’ to categorize them more easily and make sure your map isn’t overwhelmed with pins, and there’s the option to get automatic push notifications whenever people leave from or arrive at a place (the kids getting home from school, for example).